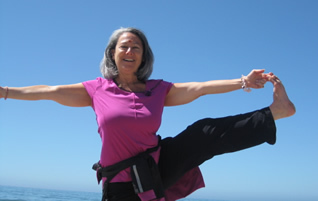 Leena is qualified to teach yoga teachers at the 200 and 500 hour training levels. See below for class preparation tips and class description definitions. Photo of Leena with students at Oak Hill Park Community Center, Danville/Alamo, CA. Alignment with Ayurveda: The science of wise living. Hybrid Yoga Series: All Levels, focus on Yoga Levels 1-2, Adaptive, include meditation and breathing practices. See description definitions, below. TLC and New Beginner Yoga Series: Ultra gentle, entry-level “How-to” foundation class including back care basics, meditation, breathing and adaptive/modified poses with props appropriate for physical limitations or low mobility. Asana (posture) focus is on proper alignment in a safe, non-harming range of motion. Level 1-2-Advanced Beginner/Emerging Intermediate: Meditation, breathing with Yin and Hatha Flow asanas (postures) for the practitioner in fairly good physical condition who has had a regular yoga practice at some point in their lives. Adaptive as needed for physical limitations or additional challenge. Restorative Yoga: The Art of Relaxation, The Practice of Rejuvenation: Deeply meditative, deeply relaxing, healing, all levels. Restorative Yoga comprises a series of well-supported floor postures allowing gravity to do the “work’. Deep releases of long-held tension expand range-of-motion while practicing “conscious relaxation” for an extended time. The focus is mind/body/breath effortlessness and ease. You will learn basic postures and how to use props to safely and comfortably to support the body toward harmony and balance. Instruction is compassionate, soothing, personalized and light-hearted. TLC Yoga: Adaptive, Back Care Basics, Meditation, Breathing and Hatha Flow. YOGA CLASS DESCRIPTION DEFINITIONS: Based upon popular U. S. descriptions from Classical lineages which incorporate postural alignment of Master Yogis B. K. S. Iyengar, and Baba Hari Dass. All Levels: Class tailored the class to the level of the students present, all abilities are welcome. Yoga Back Care Basics: Therapeutic class for people with ranging back issues who seek serious, strength building and flexibility. Gentle Yoga: Easy-going postures for those with limited flexibility or strength. Hatha Flow: Flow of the breath guides natural movement of the body allowing energy to move freely, bringing balance and unity. Yoga 1: Basic postures focusing on alignment, breath awareness and relaxation. Yoga 1-2: For experienced beginners who wish to learn to build strength in holding postures. Yoga 2: Intermediate level postures with in-depth focus on alignment and breath awareness. Yoga 2-3: Intermediate-Advanced level that focuses on strength and breath awareness. Yin Yoga: Passive floor postures are held for several minutes for a positive and safe release of the deep layers of connective tissue in the body. Adaptive Yoga: Modified poses with props appropriate for physical limitations or low mobility. Restorative: Deep relaxation, healing, supported postures. Practice at least 2 hours after eating. Wear clothes that allow free motion, support and appropriate modesty. Notify instructor about any physical problems or injuries. FEES: Vary upon venue contracts, length of class, series or drop-in. See individual class listings. PRIVATE SESSIONS: Individuals, couples, parties, families and youth yoga parties, conferences and retreats. Contact Leena. **Ayurveda is the ancient sister-science to yoga and the precursor to Chinese Medicine. Ayurveda precepts facilitate living in harmony with nature including Her seasons, weather and room conditions. Leena is certified as an Ayurveda Diet and Lifestyle Counselor through Mount Madonna Center.